She is also the founder and CEO of RA MA TV, RA MA Records and the RA MA Foundation. In 2017, Jagat created the Aquarian Women’s Leadership Society, which has members in over 20 countries. But far from an inaccessible ascetic, this woman is a modern entrepreneur with a strong marketing and digital vision (including a hilarious Instagram account), surrounded by millennials and Gen Z coworkers. We sat with her during her recent trip to Paris and discussed spirituality, empowerment, the physiological power of the word guru, as well as her future projects and dreams. INSIDE/OUT: What’s your genesis story? GURU JAGAT: I think that if anyone is experiencing any kind of success or fulfillment it is through work ethic. I am very American - east coast - in the way that I believe this. In NYC, you work 80 hours a week, so when I moved to LA I tuned to that kind of work. From Beyoncé to women politicians, and especially for women of color, as women we have to work harder. That’s the truth of the matter. When I went to the west coast my east coast work ethic was a big help because I was used to pulling up my sleeves, getting busy and dirty. This has gotten me everywhere. Everyone thinks it’s an overnight success story, but it never is. As an entrepreneur, a leader and a woman, the way I see work as a spiritual practice has been really powerful. We work seven days a week but we all love it because we’re passionate and creative. I have mostly women in my team, though I do have wonderful men, too. I particularly love to work with the younger generation of men as they are so much more expanded and ready to take on some of the problems that the patriarchy has installed in all of us. So it started there. I was also raised with an inclination for spirituality. I don’t think it’s my first go around with the spiritual life. I think my teacher Yogi Bhajan knew that Western women would be at the forefront of the change of consciousness on the planet and I think in many ways he groomed me - like my teacher Harijiwan after him - to become the kind of leader that I am and that I am becoming in the world, in the women’s movement, in the wellness world and also as an entrepreneur. I’m not just a yoga teacher. I have an international business with a non-profit, a record label and a university on the way. I’m also an author. I’m a poet. I’m a teacher. I was hesitant with the yoga scene. I was really into the living food scene and I was part of a small group of people who brought living and raw foods into the forefront of New York City and that the time there was nothing like that. I helped open a living foods boutique, we were talking about cleansing and raw food, enzymes and juices before anybody. This was in 2000. So I was really into it and there were people around me into yoga but it was not until post 2011 that I started to practice. I was looking for a teacher and I wanted something real. I did not want to just go to the gym! Yogi Bhajan came to me before I ever met him. It was a hard time in my life. I did not realize until recently. But he had come to me in a vision, I did not know who he was though, and he told me that I had a bigger destiny and that I had to find it. A couple of months later, maybe a year, I found Kundalini yoga and him. I was not there for 9/11 because I had a vision and I went to Maui. I knew there had to be something more than working, getting married, popping out a couple of kids and then die, and I was looking for it in Maui. And my answer came shortly after 9/11, New York had changed so much and I ended up going into a Kundalini class. Everything had changed. It was a fundamental change, not just in America. I think there was a huge international shift. Tell us about your company and your community. I founded RA MA because I wanted to create something that would be a think tank or a feel tank where arts, fashion, collaborations, community, spirituality, and yoga could all live under one roof, under a big tent. And Venice Beach was a really great place to do it because it is very much a crossroads of those things. And one of the things I was very proud of in the first studio, and we extended to the other studios and offerings later, was the community. It’s very eclectic in terms of age, backgrounds, diversity. There are a lot of creatives and that leads to an interesting experience of energy. So many projects have come up of RA MA Venice. It’s a very rich and creative community. People meet and they collaborate on a movie or on a business. So much has been built out of that community and I am particularly proud of it. They come in their jeans, they’re 45 minutes late, they leave whenever they want, they come into class and do some stuff, it’s very casual. Anybody can come, it’s an open-door policy. The other studios, Lower East Side and Mallorca, are built in a way that they are more about performance art as we have a big window, a stage and people can watch through the window so we have a big crowd in front of the studio like it’s a theater. It’s like a show, like coming to a concert, you buy your ticket, you can come in, you can come late, you can come early, stay late. We have a continuous amount of programing so things just go back to back and people can come and go as they please. I love the fact that it’s so different from uptight studios where you have to get there ten minutes early, have your yoga mat, be dressed a certain way, or be able to touch your toes. We are totally open. We attract artists. In New York, one of our clients, a Lower East Side 80’s visual artist and one of the first woman digital artists, just sold some pieces of her collection to the MOMA. 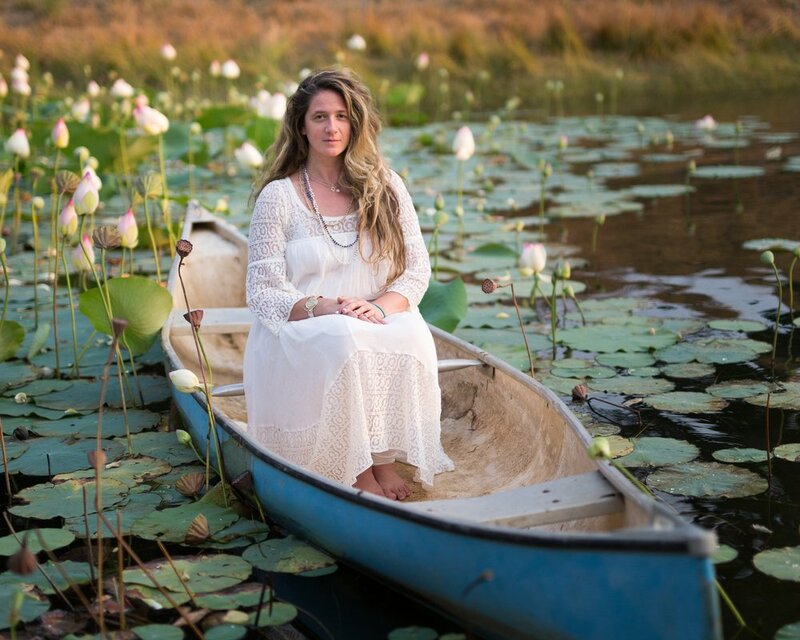 Her Kundalini practice has been a real pivotal moment for her and her career. And we have countless stories like that. And what about your digital development? I do RA MA TV all the time. For example, I was in Aspen last weekend, it was the solar eclipse - a big event - and I was able to give my teacher’s class from my hotel room…This is so cool! Tell us about the RA MA Foundation. The RA MA Foundation brings wellness to underserved communities through a by-donation wellness and meditation center in underserved parts of Los Angeles. We’re also building a university. It’s a big project for us: including yogic science and sacred sciences of the yoga lineages, neuro science, psychology and art as a contemplative practice, an outpouring of your meditation and wellness as opposed to art as a result of your neurosis and your pain (which is what it has been for so long). So we’re busy! How do you define ‘guru’? There is a misunderstanding about this particular subject. ‘Guru’ is not a title in our lineage, it’s a name; so if you go to India, Jagat Guru would be like Marie Sue. Jagat Guru is more common than Guru Jagat. But this name is not given to women. My teacher Yogi Bhajan gave me my spiritual name because that’s how our lineage’s work. And again, it’s just a name. Today, the concept of the guru is pretty much related to an age where we gave all of our power away - to the politicians, to the government, to the bank, to our husbands, to the corporation … and to the guru - to take away your karma. And this is what is shifting on the planet. I feel that Yogi Bhajan gave me that name as a disruptor of what that actually means because in our lineage, the sound ‘guru’ itself affects the vagus nerve (cranial nerves). When you say ‘guru’ and you put the tip of the tongue to the roof of the mouth, it vibrates in your own neural chemistry to create an expansion of your own limiting believe patterns. So that’s the sound science behind the term ‘guru’. It’s inside out to the way that we’ve been taught that the guru is going to come and be all powerful and wise and take over so that you don’t have to think anymore. The guru is going to tell you what to do…That’s a very unempowered idea of spirituality. So I’m here to say that we’re not going to play that game anymore and that this is a major time of self initiation. I have to do it for myself. You have to do it for yourself. I’m an echo, my life is dedicated to a reminder of that principle. This is a time of self mastery. So do you see yourself as an influencer, a leader, an activist, a disrupter? All of those things. I’m absolutely a leader and an activist. And I feel that a part of my mission, through my own work and my own meditative, spiritual and creative practices - as I also see myself as an artist - is to show a new mutation of an archetype of what it is to be a powerful woman and a householder. We don’t go meditate in caves in my lineage; we’re here in the world, in a hotel in Paris having a soy latte. We’re living in this world and the question is: ‘how can we make this world a better world?’ because this world needs it so bad. So my mission is to break a lot of those ideas. Because in the past, not only the world of spirituality was dominated by men but if there was a woman, she was in robes, with a shaved head, she was a monk or a none. Not married. Like mother Theresa or Amma. These are the archetypes of spiritual women. I really feel I’m here to inhabit a modern archetype of a spiritual leader, a business woman, an artist, and a woman who’s somehow non conformist. I’m not married by choice, I don’t have children by choice. I have a very different kind of experience with life and I think it’s really important now. You teach women how to find their archetypes as a goddess. What is your archetype? I am hybrid between Venus and Athena! Love and justice and righteousness. How do you reconcile modern times and ancestral teachings? Yogi Bhajan was very hip on what was going to happen in the technical age and when he was talking about it, people would not believe him. In the seventies, he was talking about smartphones and this constant flow of information. He was a futurist, talking about Kundalini yoga as a technology. So in many ways, it’s been easy for me to understand and translate the ancient teachings into a more modern world. This age is a powerful time of dismantling constructs because technology has given us a transparency that’s very strong. I think It’s special and so immediate. That’s why I’ve used technology so much in building the brand. This technology being a platform for our message and the culture of RA MA, because we need to use these tools instead of letting them use us. There’s no grey area anymore. And also I’m simply a modern woman and it would be out of authenticity not to offer the most modern kind of experience when that’s how I live my life. I surround myself with the millennials and the Gen Z so I can keep in touch with the pulse of the new generation. What challenges or obstacles do you face as a women? I have been surprised over the years, and I know I should not be, that we are still hitting such a glass ceiling. I have been in the room with the CEOs of wellness brands, those of the ‘white males' configuration and realized how offended they can be by things that I say. And I know that if these things had been said by men, it would not have even been on their radar. When it first happens, it’s shocking - you realize that you must be a threat to them. Then it became how I realized that we were really up to something. I always take that as a compliment if it really affects someone that I’m just being myself. There is also a conversation about the privilege of being a white woman in the world, as I had been getting into places where women of color would have had a much harder time. And I’ve been meditating a lot about it. It think it’s all gradient scales. And whether we have children or not we, as women, have a new level of responsibilities, creating the future. I think it’s a powerful time where we all have to come together in a community of men and women of all diverse backgrounds to accomplish what has to happen on the planet in order to save our civilization. think that’s going to be more of a conversation in the next couple of years, when we’ll realize that we are in a crisis of water, a geological crisis. That’s going to become much more of a conversation. The privilege of being alive. But it’s a very important time of healing for all of us. You wrote a book called Invincible Living: The Power of Yoga, The Energy of Breath, and Other Tools for a Radiant Life, what are the key ideas to become invincible? I wanted to write something that anyone could open and get something from, quickly. That would help them manoeuvre the times. It’s about how much we focus either psychotherapeutically, or in the wellness scene, or just in general on our failures; on what’s wrong with us and on our problems. I feel that the true way of someone who has fulfillment and success is to focus on the right things - such as their successes and their strengths instead of their weaknesses. This book is a manifesto on how to focus on the parts of you that are the strongest, or the most resilient and how to make them more. The more you do that, the more it becomes your dominant experience rather than what we’ve be taught: “I’m going to go to therapy and sit around for an hour and talk about my problems.” We’re calling our friends, our family and we’re complaining. And to anybody who would listen, we talk about our problems. Think about how much that’s happening all week long. No wonder we don’t feel good. This book is about the strength of the human spirit, body and mind, and how to optimize it. You have studios in LA, New York and Mallorca, what’s next? I’m writing a book about women and what is needed for women in these times. What are the ways to really create a new type of leadership, of health and of mental and physical and economic health. I’m designing a beautiful capsule collection, studio to street, white clothing for Kundalini. That’s a fun project. I love fashion and I love the way good clothes make you feel. I really don’t wait it to be a vanity project. I want it to be beneficial and I’m excited about it. It’s going to be produced in LA and I like to be able to produce in India just because the cotons are amazing over there but we’ll see. This is a new step into that scene and I’m hoping to launch it on the Spring Equinox. I hope I will be able to create some menswear, too, because men always complain that they don’t have anything good to wear to go to yoga and then keep on to go to lunch. So we’ll work on it. Then we don’t want to open an other studio but we’re looking to expend the RA MA Festival, a full mind/body experience in a festival setting. This is the next thing for people. We did one on Mallorca last year and it was really successful. We’ll do an other one this summer around the last week of July. We have panel discussions, talks, yoga and wellness, meditation, music, theatre and also activism. Then we’ll bring it back to the States at some point. We’re not sure where and when nut that’s a big project, especially as I want to bring a theatre component into it ad some live performance. Wellness and women's empowerment have finally begun to spread throughout France for the past couple of years. Anything in particular you would like to tell your students here in regard to embracing these new concepts fully? I think It’s important that the glandular system, when it’s optimized, the amount of energy and vitality and radiance that naturally starts to come through your system and in your life, relationships and businesses is really the fundament of what wellness is. And Kundalini technology is so immediate with those things that if you get your glandular system balanced, then your whole mind/body/spirit, the kind of thoughts you’re having, the way you’re behaving, your personality, all of that will come into balance. It’s important for us to understand that, because lots of people think they don’t have the discipline to stay on a diet or not to get angry at their boyfriends… There is this idea that we’re not good enough because of those things when really I think it’s more biochemical than that. I think it’s a a relief for women to understand that if your get your biochemistry balanced you’re going to be nicer to everybody around you and to yourself, you’re going to be more creative, more radiant naturally. Where do you see yourself and RA MA in 10 years? The North Star is RA MA University so we’ll definitely have RA MA University open and people will be able to come and study academically and non academically… Sound sciences, new brain sciences, new ideas around science of the mind, psychology, arts, business. I’m speaking about business at Harvard in the Spring. I also have books to write now and my global women’s movement will take off to a brand new level of leadership. If it was appropriate I would consider running for a political office. Thank you: Elodie Garamond and Le Tigre Yoga.